Since 1971, Dontech has designed and manufactured innovative optical products for medical, military, avionic (commercial and military) and industrial applications worldwide. 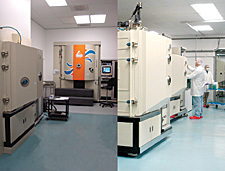 We have two manufacturing sites: our 40,000 sq. ft. corporate headquarters and a new 6,000 sq. ft. second manufacturing site. Dontech features vertically integrated manufacturing (thin film coating, conductive grids, hard coatings, machining, substrate lamination, optical bonding) to support rapid design, development and manufacturing of innovative optical filters and assemblies. We also have an extensive metrology laboratory (optical, mechanical, and environmental testing) for the design and qualification of optical filters and assemblies. Dontech is an AS9100D and ISO 9001:2015 registered designer and manufacturer of optical filters and assemblies. Dontech is an equal opportunity/affirmative action employer. We consider applicants without regard to race, color, religion, creed, gender, national origin, age, disability, genetic information, marital or veteran status, or any other category protected by federal, state, or local law.